Congrats on your fabulous win! I see you put all those new goodies right to a good use too with this pretty card! I love that you de-bossed the background too - it's a unique and fun look with those pretty flowers and colorful butterfly! Your layering looks amazing and the punched border is quite pretty too! NJ! Mi piacciono molto i vostri fiori allegro farfalla luminosa e bella è una bella aggiunta. Ed è perfetto per il nostro Penny nero e più challenge, grazie per la partecipazione. Just stunning! 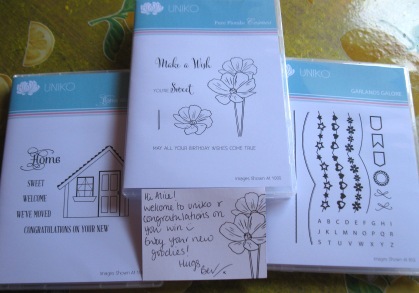 Lucky you winning over at Uniko and I adore this card you made! 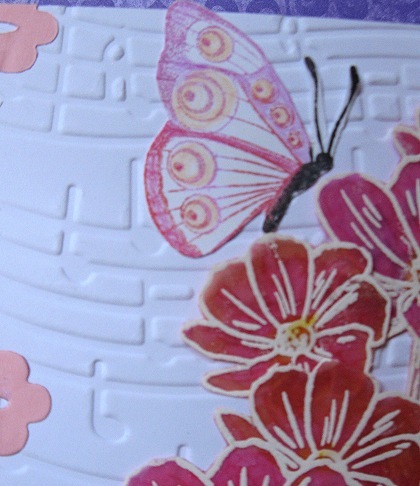 Beautiful embossing and colours! Oh, congratulations on your prize, Alice!!!! These are wonderful stamps to win! I love your card - so pretty with the white outline and beautiful colouring! I like the debossed musical background - a happy accident I would say! I think you did great with your first CAS card! I found them tough when I first tried - I practiced a lot to get a CAS card! But now I really enjoy them! Well done! Hope you have a great day, my friend! You're one lucky lady! Congrats on winning all those stamps. I love what you did with the flower stamp. 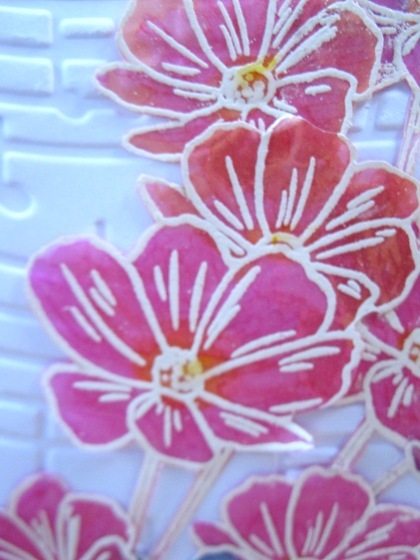 The flowers look so beautiful embossed onto vellum. Nice touch adding the butterfly too (haven't used mine yet). Even though it's not ultra CAS, it's a cleaner design than what you normally make, I think it's beautifully balanced. A beautiful card, such pretty flowers. Wow, fortunata e pure brava!!! Bellissimo come hai usato questi timbri...ehehe mica facile lo stile CAS?eh!? Sembra sempre troppo vuoto! Very pretty flowers on your beautiful card.Congratulations with your prize. Wow, the flowers are stunning! Love the white embossing and then colouring! Love this! The flowers really pop against the embossed background. Thanks for joining us at 613 Avenue Create and I hope you'll join us again soon. 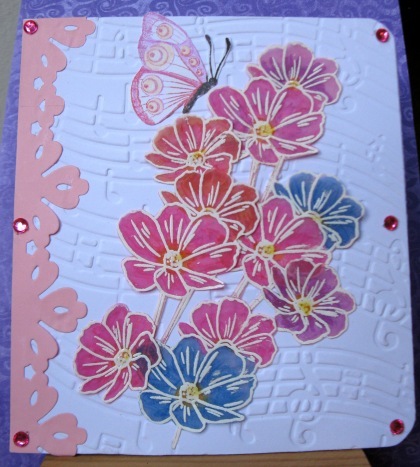 I saw your beautiful stamping and embossing on your card , great ! Such beautiful vibrant colours which show off the cosmos flowers perfectly. Love it! Thanks for playing at Uniko. Lovely and elegant card, beautiful stamps, you were so lucky!